During a mother’s hospital recovery from giving birth, there are many emotional nuances and unforeseen adjustments to contend with. Being able to reach out to her newborn quickly and safely from her bedside—whether for breastfeeding or comfort—as well as being able to lay the infant down again, make a huge difference and are often overlooked. Side-car bassinets, which are widely used in Europe, provide distinct mother-child bonding opportunities, as well as offer maneuverable transport within a hospital setting. Last spring, a sponsored graduate studio focused on redesigning these bassinets for future use in the United States. The studio provided real-world exposure to its students, including Pratik Bendale, a Track-3 graduate student in industrial design (ID). “This project is one of the best so far. It’s research-intensive; in other projects we started earlier with design, but this one [focused on] research and user feedback first, and it’s been amazing,” he said. The interdisciplinary collaboration was organized and managed by Dr. Kristin Tully of the Carolina Global Breastfeeding Institute (CGBI). She served as the principal investigator on the Improving Human Health Award, presented by the North Carolina Translational & Clinical Sciences Institute at the University of North Carolina at Chapel Hill. This, in addition to a Patient-Centered Outcomes Research Institute Engagement Award, made possible bringing together industrial design faculty and students, the design and engineering firm Trig Innovation, and a group of UNC medical specialists, including: Catherine Sullivan, MPH, CGBI director and clinical assistant professor at the Gillings School of Global Public Health; Dr. Carl Seashore, Professor of Pediatrics at UNC School of Medicine; and Dr. Alison Stuebe, Associate Professor of Maternal-Fetal Medicine at the UNC School of Medicine. The objective of the collaboration was to use current data on side-car bassinets and gather additional research and discovery through various design methodologies so that new ideas and solutions could be considered for development. In essence, to better understand the experiences and maternity needs from end-users and care providers to inform the design process. Throughout the semester-long project, students collected data and conducted research to propose design solutions that were reviewed and critiqued by the entire team. The findings eventually led to Trig taking over the project to further develop actual prototyping and product solutions to be tested within UNC Hospitals, with the intention of refining these for widespread manufacturing. The ID studio was guided by Dr. Sharon Joines, Professor of Industrial Design, who is a passionate researcher and ergonomic expert with a focus on human-centered design, design methodologies, and interdisciplinary design solution development. A unique twist to this studio was that, in addition to the various partners involved with critiques and discussions, additional faculty members—Kelly Umstead, Assistant Professor of ID, and Carolina Gill, Associate Professor of ID—also were involved. “I’ve never had a studio project where we have one lead faculty and two other faculty who truly participated in each one of the critiques—for me it was a lovely experience to work with them,” shares Joines. Throughout the semester, members of the Trig team periodically dropped in to see the students’ progress and to provide valuable feedback. Seth Teeples, an industrial designer at Trig who was involved in the project, says, “When students get to a certain milestone in the project, we come and provide judgment and suggestions.” He hopes students will consider testing every angle of their projects. 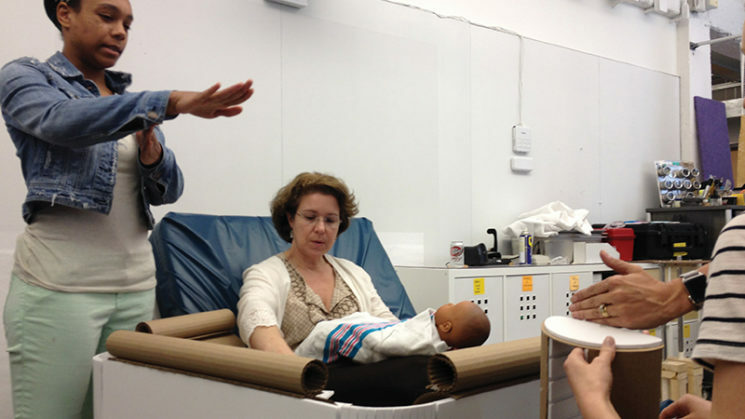 In order to fully understand the variable complexities to be incorporated in the design process, students toured the UNC Medical Center’s Maternity Care Center with the team and clinical professionals in order to observe patients and medical staff interacting with the bassinets in actual settings. This includes how a mother lifts her baby, her emotional state, her needs, how the bassinet attaches to the hospital bed, and how it is wheeled from one location to another within the hospital setting. 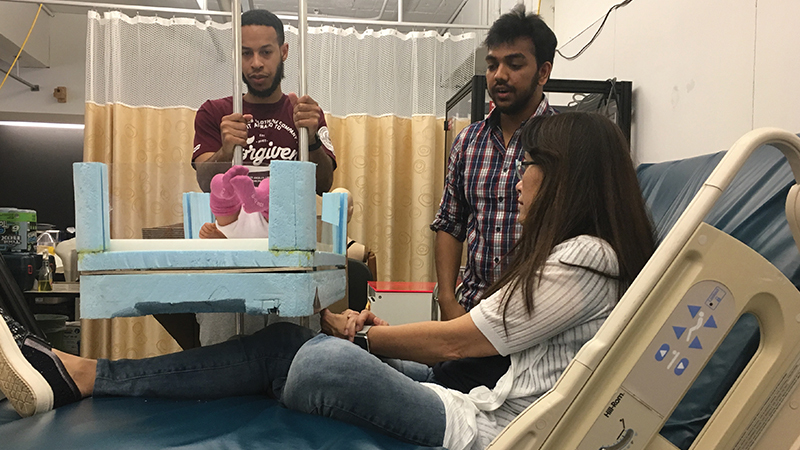 An actual hospital bed and bassinet were available in the studio so that students could analyze and better understand the functioning and mechanical constraints in order to develop design solutions. “Having the right end-users is critical,” adds Joines, who also shares that Tully had done an exceptional job of developing the project and making sure that all the appropriate partners were actively engaged. In their final critique, students presented research findings and design ideations to Tully and her team, members from Trig, and ID faculty members. Several of the students developed prototypes of their projects to provide a deeper understanding of their concepts. Ten projects were presented, and the team asked questions, proposed additional scenarios, and offered feedback. The team tabulated surveys of each project in order to determine viable solutions that would move forward with Trig. “We pick up the project from here, pulling the best from the best of ideas and solutions,” notes Ty Hagler [’11], Principal of Trig. “This is a huge educational experience—the process of introducing design and design thinking in this way. The degrees of risk tolerance are very different, and to bring these two professions [design and medical] together is a lot of fun,” Hagler adds.